EIA ‘s most recent Petroleum Supply Monthly shows that U.S. ethane production has recently remained relatively flat—averaging 1.71 million barrels per day (b/d) in July 2018, slightly lower than its record high of 1.72 million b/d in April 2018. This steady production level is in spite of increasing ethane prices, which would suggest increased economic incentives for natural gas plant operators to maximize ethane recovery. 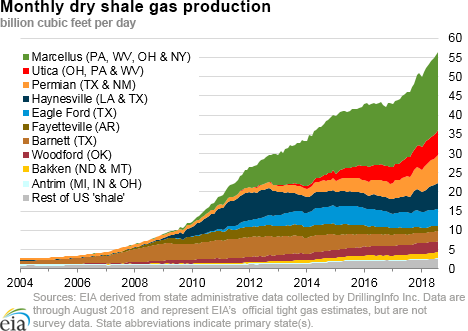 However, regionally, ethane production has varied since April because access to infrastructure and regional price differences affect the cost to extract ethane, depending on the production basin where the ethane is extracted. A wide spread in ethane spot prices has developed between the two major U.S. hydrocarbon gas liquid (HGL) trading hubs: the Mont Belvieu, Texas hub on the Gulf Coast, where much of the ethane demand and export capacity is located, and the Conway hub in Kansas, which serves as a major trading point for Midcontinent production. 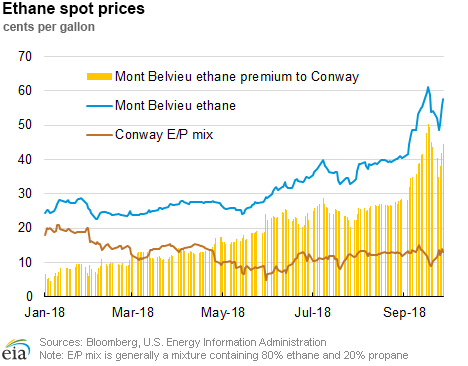 Ethane prices at Mont Belvieu have risen from an average of 28¢/gallon (gal) in April 2018 to 36¢/gal in July. In contrast, prices for E/P mix (generally a mixture containing 80% ethane and 20% propane), which serves as a proxy for ethane values in the absence of purity ethane sales at Conway, fell from an average of 14¢/gal to 11¢/gal during the same period. 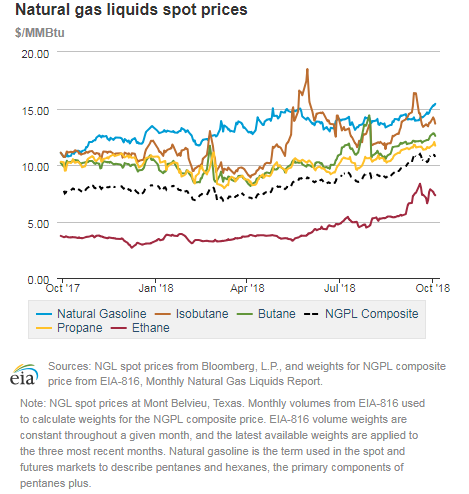 This widening differential for ethane prices is a result of limited access to the infrastructure that transports and separates natural gas plant liquids (NGPL) into purity products (ethane, propane, isobutane, normal butane, and pentanes plus). Natural gas plants produce NGPL as a mix of these purity products known as Y-grade. Pipelines transport Y-grade to fractionators that split the mix into the purity products—a process referred to as fractionation. 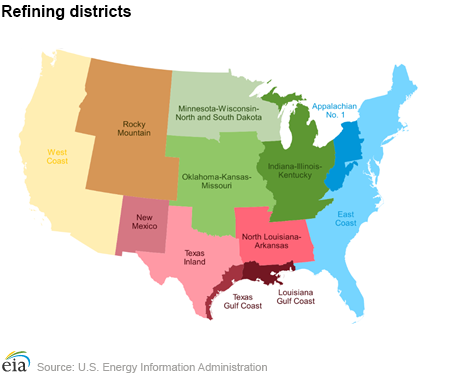 Although natural gas production and processing (and the subsequent production of Y-grade) is geographically dispersed across the country, the capacity to separate the NGPL stream into purity products is highly concentrated along the Texas Gulf Coast. Pipelines that enable long-haul transport of Y-grade from natural gas plants to fractionators along the Texas Gulf Coast charge a tariff that is generally based on product volume and distance shipped. As a result, when pipeline capacity is constrained, shippers will prioritize the transport of products of the highest value, particularly over long distances. Ethane spot prices, although higher than earlier in the year, are the lowest among all NGPL components. Most natural gas plant operators can modify the amount of ethane they recover from raw natural gas, depending on ethane’s relative value to natural gas. 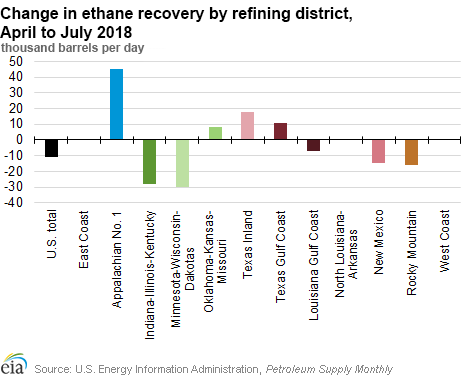 As a result, since April, for producers in the Midwestern refining region and the Rocky Mountain region that produce Y-grade, which is transported largely to the Conway hub, it is less economic to recover ethane and ship it as part of Y-grade alongside other, more valuable products. The ethane fraction of NPGL shipments from the Rockies to the Gulf Coast dropped from 35% in April to 33% in July; the ethane share of NPGL shipments from the Rockies to the Midwest declined from 21% to 20% during the same period. On a national scale, this decline has been almost completely offset by corresponding ethane production increases in regions where either sufficient pipeline capacity exists to transport purity ethane to Mont Belvieu—such as the Appalachian region—or in nearby regions with direct Y-grade pipeline connections to the Gulf Coast hub. Natural gas spot prices rose at most locations this report week (Wednesday, September 26 to Wednesday, October 3). 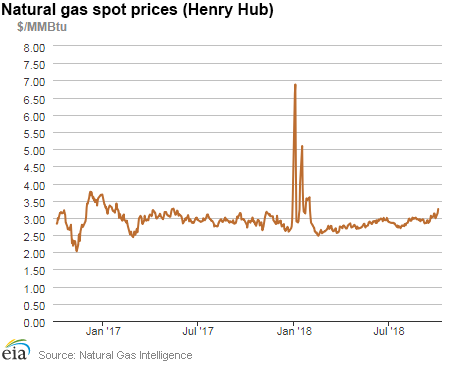 Henry Hub spot prices rose from $3.13 per million British thermal units (MMBtu) last Wednesday to $3.26/MMBtu yesterday. At the New York Mercantile Exchange (Nymex) last Wednesday, the October 2018 contract expired at $3.021/MMBtu. The November 2018 contract price increased to $3.230/MMBtu, up 25¢ Wednesday to Wednesday. Net injections to working gas totaled 98 billion cubic feet (Bcf) for the week ending September 28. 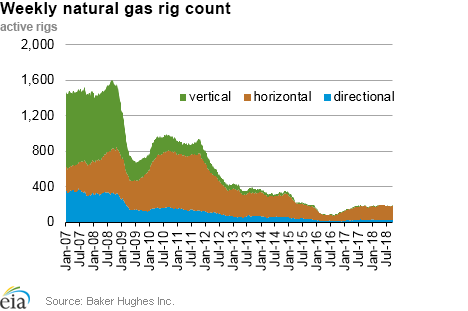 Working natural gas stocks are 2,866 Bcf, which is 18% lower than the year-ago level and 17% lower than the five-year (2013–17) average for this week. The natural gas plant liquids composite price at Mont Belvieu, Texas, rose by 43¢, averaging $10.80/MMBtu for the week ending October 3. The price of natural gasoline, ethane, propane, butane, and isobutane all rose, by 5%, 7%, 2%, 4%, and 3%, respectively. According to Baker Hughes, for the week ending Tuesday, September 25, the natural gas rig count increased by 3 to 189. The number of oil-directed rigs fell by 3 to 863. The total rig count increased by 1, and it now stands at 1,054. The national benchmark average spot price increases for the third straight week. This report week (Wednesday, September 26 to Wednesday, October 3), Henry Hub spot prices rose 13¢ from $3.13/MMBtu last Wednesday to its weekly high of $3.26/MMBtu yesterday. This report week marks the third straight week of price increases; during this time, Henry Hub spot prices have risen 11%. Henry Hub and spot prices increased with forecasts of cooler weather across the Great Plains and low storage inventories in the Lower 48 states. At the Chicago Citygate, prices increased 29¢ from $2.89/MMBtu last Wednesday to its weekly high of $3.18/MMBtu yesterday. Prices at PG&E Citygate in Northern California rose 22¢, up from $3.28/MMBtu last Wednesday to its weekly high of $3.50/MMBtu yesterday. Prices at SoCal Citygate increased 72¢ from $3.70/MMBtu last Wednesday to its weekly high of $4.42/MMBtu yesterday. Northeast prices increase. At the Algonquin Citygate, which serves Boston-area consumers, prices went up 37¢ from $3.23/MMBtu last Wednesday to $3.60/MMBtu yesterday. At the Transcontinental Pipeline Zone 6 trading point for New York City, prices increased 44¢ from $2.85/MMBtu last Wednesday to $3.29/MMBtu yesterday. Tennessee Zone 4 Marcellus spot prices increased 22¢ from $1.70/MMBtu last Wednesday to $1.92/MMBtu yesterday. Prices at Dominion South in southwest Pennsylvania fell 7¢ from $2.16/MMBtu last Wednesday to $2.09/MMBtu yesterday, reaching a weekly low of $1.21/MMBtu on Monday. Tennessee Gas Pipeline, which transports natural gas from the Gulf of Mexico to the Northeast, issued a Force Majeure on October 2 for an Emergent Repair at Station 317 near Troy, Pennsylvania. An estimated 0.15 Bcf of natural gas could be affected, and the estimated in-service date is October 19. Discount at key Permian Basin trading hub persists. Prices at the Waha Hub in West Texas, which is located near Permian Basin production activities, averaged $1.36/MMBtu last Wednesday, $1.77/MMBtu lower than Henry Hub prices. Prices reached a weekly low of 88¢/MMBtu on Monday. Yesterday, prices at the Waha Hub averaged $1.04/MMBtu, $2.22/MMBtu lower than Henry Hub prices. Nymex futures increase. At the Nymex, the October 2018 contract expired last Wednesday at $3.021/MMBtu. The November 2018 contract increased to $3.230/MMBtu, up 25¢ from last Wednesday to yesterday. The price of the 12-month strip averaging November 2018 through October 2019 futures contracts climbed 12¢ to $2.931/MMBtu. Supply remains flat. 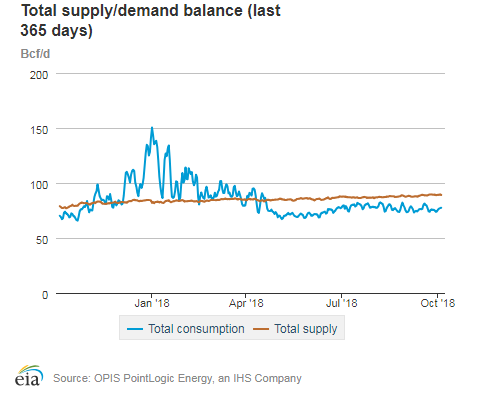 According to data from PointLogic Energy, the average total supply of natural gas remained the same as in the previous report week, averaging 89.3 billion cubic feet per day (Bcf/d). Dry natural gas production remained constant week over week. Average net imports from Canada increased by 5% from last week. Overall demand decreases with lower power generation. Total U.S. consumption of natural gas fell by 1% compared with the previous report week, according to data from PointLogic Energy. Natural gas consumed for power generation declined by 6% week over week. Industrial sector consumption increased by 1% week over week. In the residential and commercial sectors, consumption increased by 12% with mixed regional heating and cooling demand. Temperatures were close to normal across much of the Lower 48 states, but warmer than normal in the Southeast and Southwestern regions and cooler than normal across the Great Plains. Natural gas exports to Mexico were the same as last week, averaging 4.8 Bcf/d. U.S. liquefied natural gas (LNG) exports decrease week over week. Four LNG vessels (all from the Sabine Pass liquefaction terminal) with a combined LNG-carrying capacity of 14.2 Bcf departed the United States from September 27 through October 3. One tanker (LNG-carrying capacity 3.8 Bcf) was loading at Sabine Pass on Wednesday. No LNG vessels departed from Cove Point last week because the facility is undergoing scheduled maintenance. The facility has not received any natural gas feedstock pipeline deliveries since September 21. Cheniere Energy, the operator of the Sabine Pass liquefaction terminal, has filed a request with the Federal Energy Regulatory Commission to introduce refrigerants as part of the commissioning activities for Train 5. The first LNG export cargo from Train 5 is expected before the end of this year. Net injections are higher than the five-year average. Net injections into storage totaled 98 Bcf for the week ending September 28, compared with the five-year (2013–17) average net injections of 84 Bcf and last year's net injections of 44 Bcf during the same week. Working gas stocks totaled 2,866 Bcf, which is 607 Bcf lower than the five-year average and 636 Bcf lower than last year at this time. Working gas stocks’ deficit to the five-year average decreases. The average rate of net injections into storage is 15% lower than the five-year average so far in the 2018 refill season, which covers April through October. If the rate of injections into working gas matched the five-year average of 10.4 Bcf/d for the remainder of the refill season, total inventories would be 3,208 Bcf on October 31, which is 607 Bcf lower than the five-year average of 3,815 Bcf. In the Lower 48 states, total working gas stocks are 263 Bcf lower than the five-year minimum, and every storage region is near or lower than the bottom of the five-year range. As of this report week, the Midwest region is 87 Bcf (10%) lower than the five-year minimum, and the South Central region―including both salt and non-salt facilities―is 70 Bcf (10%) lower than the five-year minimum. The average January 2019 futures contract price is trading at a lower premium to the average spot price than last year at this time. Price differences between the spot price and the futures price at the Nymex indicate limited economic incentives for injections into working gas. 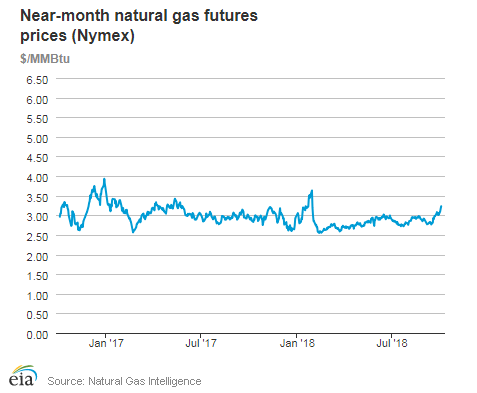 During the most recent storage week, the average natural gas spot price at the Henry Hub averaged $3.08/MMBtu, and the Nymex futures price of natural gas for delivery in January 2019 averaged $3.18/MMBtu, 10¢/MMBtu higher than the spot price. A year ago, the January contract was 29¢/MMBtu higher than the spot price. Reported net injections into storage are on the upper end of the range of analysts’ expectations. According to The Desk survey of natural gas analysts, estimates of the weekly net change from working natural gas storage ranged from net injections of 77 Bcf to 99 Bcf, with a median estimate of 88 Bcf. At the 10:30 a.m. release of the Weekly Natural Gas Storage Report, the price of the Nymex futures contract for November delivery at the Henry Hub fell by 2¢/MMBtu to $3.17/MMBtu, with 622 trades executed. The price continued to decrease in subsequent trading to about $3.14/MMBtu. Temperatures were significantly warmer than normal for the storage week. Temperatures in the Lower 48 states averaged 68 degrees Fahrenheit (°F), 3°F higher than normal and 4°F lower than last year at this time. Temperatures were 3°F lower than those reported for the previous week.